Fall is here, and as the somewhat recent cliché goes, get ready for pumpkin-flavored everything. And, yes, that includes beer. Pumpkin beer in the U.S. is as nearly old as America itself, although times are different now. Buffalo Bill’s Brewery in California gets credit for reviving pumpkin beer back in the 1980s, and I’m not sure we should be thanking ol’ Bill. Because whereas an authentic pumpkin beer would have relied on pumpkin for malts, these days too many pumpkin beers seem to be more focused on pumpkin spice. I have no interest in a beer that tastes not at all like beer and curiously too much like a bad Halloween treat. 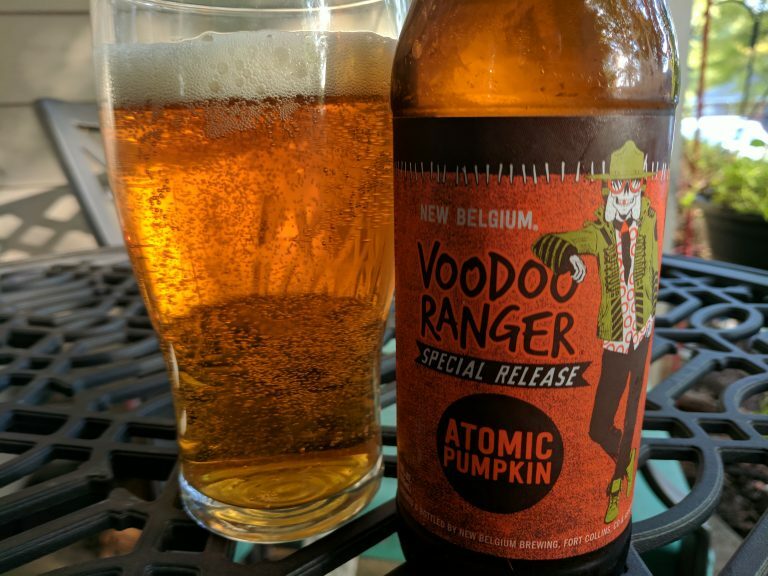 Thank goodness New Belgium managed to mostly sidestep that pitfall with its Atomic Pumpkin Ale release this year, which is part of the brewery’s Voodoo Ranger series. It’s flavored, oh yes, and when you pour it into a glass, the aroma screams pumpkin season at you, with the traditional spices and sweetness. But it’s also obvious in the nose that this beer focuses on, well, being beer. The pleasant surprise I received while reading the bottle is that while the requisite cinnamon is in the mix, it’s Saigon cinnamon, a slightly more intense version of the spice. And best of all, the brewers added some habanero pepper to the mix, giving the beer an unexpected kick. Take that, pumpkin pie beers! The beer pours, looks, and feels like a pretty standard American pale or amber ale, but the flavor profile is all its own, with the pumpkin being perceptible but not necessarily front and center. The habanero and cinnamon are also perceptible, but not pervasive. It tastes upon first sip like a good, if a bit sweet-ish, ale. Three drinks in, the beer still didn’t over-pumpkin me, with the creamy body still a pleaser and a tiny burn starting to form at the back of my palate, mixed with a bit of surprising tartness. Surely, it is a beer concocted for subtlety. At this point, I could feel my disdain for pumpkin beers taking a break as the flavors worked together. Halfway through, I was getting just enough habanero to bring a small smile to my lips, while my annual eyeroll toward pumpkin beers was taking a temporary break. Hey, I don’t necessarily like every beer New Belgium releases, but if it can pass a pumpkin beer past me, it’s doing something (else) right. With Pale Mena, Pale Rahr, Caramel, and Munich making up the malt bill and Nugget hops for balance, Atomic Pumpkin carries a 6.4 percent ABV in its medium frame. Obviously, it’s a limited release for the fall season, so grab a sixer while you can.